The EULCS and the European region has always been known for the strength of its Mid Laners. With players such as Rammus “Caps” Winther of Fnatic, Lukaz “Perkz” Perkovic of G2 and Chres “Sencux” Laursen of Misfits, there is once again an array of talent that has come to the forefront on the Rift. However, there’s a statement that analyst Martin “Defico” Lynge keeps making about Erlend “Nukeduck” Holm that’s starting to get harder and harder to refute when you look at his form this split. The Year of The Duck is upon us and it’s been a wild ride to get here! Nukeduck burst on to the professional scene in 2013 when he was apart of Swedish team Lemondogs, when they were promoted into the EULCS for the Summer Split. He was part of a new wave of Mid Laner that started to rise through the ranks after Riot implemented a region lock on players and alongside Soren "Bjergsen" Berg who was playing for Ninja's In Pyjama's at the time, was starting to a turn a few heads with their performances. As the stage progressed, Nukeduck was the vocal point of the team, Jungler Marcel "Dexter" Feldkamp started to pitch his tent to the mid lane, while getting the support of Top Laner Morten "ZoroZero" Rosenquist, ADC Erik "Tabzz" Van Helvert and Support Alfonso "Mithy" Rodriquez. The Lemondogs finished first in the regular season and runners up in the playoffs. They'd booked their place to the Season Three World championships, where Nukeduck would go on to face some of the best Mid Lane players in the world at the time such as SK Telecom's Sang-Hyeok "Faker" Lee and Oh My God's Yu "Cool" Jia-Jun. Lemondogs finished third in their group and ninth overall at Worlds. As season four came around, Nukeduck and the rest of the Lemondogs lineup decided that a change in direction and organisation was required despite the success that was had in the prior season, they chose to join one of the biggest esports teams in Ninjas In Pyjamas who had previously been relegated from the Summer split of the League Championship Season. In what was expected to be an easy return to the LCS, NIP chose to face off against Marcin "Jankos" Jankowski & Remigiusz "Overpow" Pusch's Kiedys Mialem Team in the Spring split promotion tournament. In what was meant to be a convincing win for NIP, it turned to disaster as they were beaten 3-0 and forced to play in the Challenger scene going forward. Nukeduck and NIP had a second chance to make it in to the LCS for season four in January of 2014 when his old team Lemondogs failed to register an eligible roster and were disqualified. They were required to play against MeetYourMakers and Supa Hot Crew in a play in tournament. However, this second attempt failed as quickly as it was provided to NIP and Nukeduck, when ZoroZero didn't patch his tournament client in time and NIP were themselves disqualified. To then add further insult to injury for Nukeduck, he was banned from professional play in June 2014 after failing a behaviour check for in-game toxicity and in game harassment. In December of 2014, Riot lifted the ban they placed upon Nukeduck and he returned to the LCS with Team Roccat for season five. 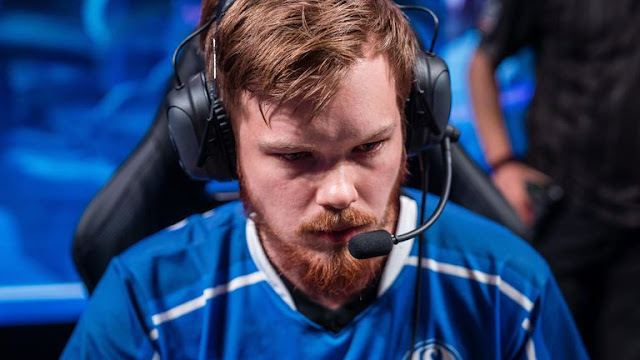 The first half of the season proved to be a rough reintroduction, after finishing 8th in the EULCS's Spring Split, Team Roccat were required to play in the Summer Promotion match against a newly reformed Copenhagen Wolves. Team Roccat won behind the play and leadership of Nukeduck which meant a return to the LCS for the Summer Spilt and the Norweign Mid laner showed a side that we hadn't seen since he came on to the scene in season three. Team Roccat finished the Summer Split in 5th place making the playoffs, However, the team and Nukeduck lost to Origen in the second round of the now infamous Gauntlet. Nukeducks stint with Roccat didn't last long, as he was picked up by Team Vitality to be their leader on and off the Rift. While they started strong behind him in the spring split of season six by finishing in third, Vitality never lived up to their potential, despite Nukeduck's ever expanding champion pool, consistent play that saw him be viewed as a top three Mid Laner by his peers and proving he had a desire to not only improve his own play but the teams as well. 2016 ended on a lower than expected note for Vitality, with them finishing in seventh place and the only bright point being Nukeducks form, Vitality had a solid building block for season seven. That block however, crumbled as soon as the season started, when a major roster change came in but the results hadn't. A poor Spring Split and a Summer Split that was Vitality start 1-3 resulted in Nukeduck being placed on the bench for Chang-Seok "GBM" Lee for the remainder of the season. 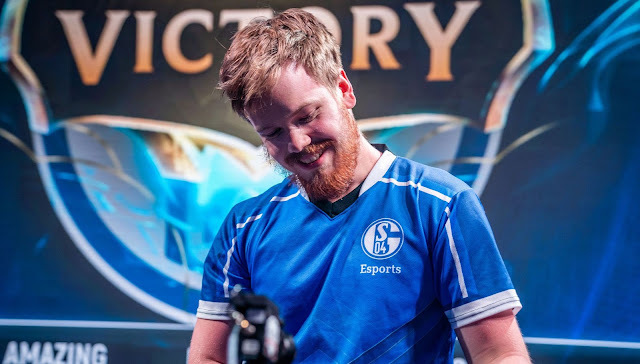 That was the last season that Nukeduck played for Team Vitality and with the new team franchising that came into play in season eight and a return to the esport by Schalke 04 ,Nukeduck once again became the leader and vocal point of a roster. The Schalke roster that had been built for the new season was the first roster in a while where Nukeduck wasn't likely to be the main carry of the team. With the likes of Kiss "Vizicsacsi" Tamas in the Top Lane and Oskar "Vander" Bogdan at support and Jungler Maurice "Amazing" Stuckenschneider to guide ADC Elias "Upset" Lipp, the support is finally there for Nukeduck to be a part of a team that can challenge for titles. While the Spring split was rougher than expected for the team, who were finding their footing with one another. The Summer split so far has seen Nukeduck be one of the more prolific Mid Laners in the game again. Although he is currently 29th in the entire EU LCS with a 3.4 KDA, he sits 2nd in CS per minute with 10.5 and 5th in kill participation with 76%. With the funnel prominent in the current meta, performances on heroes such as Aatrox and Kai'Sai has lead many to believe that he has found the form he was once well known for but also, Nuckduck himself saying that if he has a good week against premier Mid Laners Caps and Perkz in the games against Fnatic and G2. That this could well be, the year of the Duck!